Plans: Ground floor; First floor. Preparatory drawing for 'Tolbooths and Town-Houses', RCAHMS, 1996. N.d. 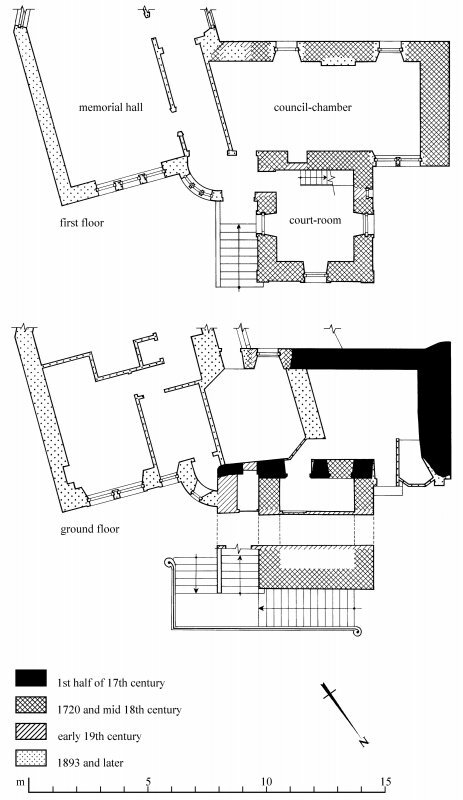 Description Plans: Ground floor; First floor. Preparatory drawing for 'Tolbooths and Town-Houses', RCAHMS, 1996. N.d. Scope and Content Plans of South Queensferry Tolbooth, City of Edinburgh South Queensferry Tolbooth dates from before 1635. An application for money for repairs was made to the Convention of Royal Burghs in 1649. The tolbooth was substantially rebuilt in 1720. Originally the ground-floor of the main block held a weigh-house to the west, and probably a jail to the east. The first floor was altered in 1770. The ringing chamber above the court-room was converted to a writing office in 1813 Source: RCAHMS contribution to SCRAN. >>> Item Level (SC 337407) Plans: Ground floor; First floor. Preparatory drawing for 'Tolbooths and Town-Houses', RCAHMS, 1996. N.d.